Watch-ya-doin is an innovative experienced based sampling framework for longitudinal data collection and analysis. 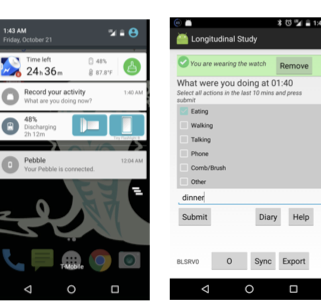 Our system consists of a smartwatch and an android device working unobtrusively to track data. Our goal is to train on and recognize a specific activity over time. We use a simple wrist-worn accelerometer to predict eating behavior and other activities. These are inexpensive to deploy and easy to maintain, since battery life is a whole week using our application. Our primary application area is AT abandonment. About 700,000 people in the United States have an upper limb amputation, and about 6.8 million face fine motor and/or arm dexterity limitations. Assistive technology (AT), ranging from myo-electric prosthetics to passive prosthetics to a variety of orthotics can help in the rehabilitation and improve independence and ability to perform everyday tasks. Yet AT is not used to its full potential, with abandonment rates ranging from 23% to 90% for prosthetics users, and high abandonment of orthotics as well. Given the cost of these devices, this is an enormous waste of a significant financial investment in developing, fabricating, and providing the device, as well as potentially leading to frustration, insufficient rehabilitation, increased risk of limb-loss associated co-morbidities, and overall a reduced quality of life for the recipient. To address this, we need objective and accurate information about AT use. Current data is limited primarily to questionnaires, or skill testing during office visits. Apart from being limited by subjectivity and evaluator bias, survey tools are also not appropriate to estimate quality of use. A patient may – more or less accurately – report his or her AT use for a certain number of hours a day, but this does not indicate which tasks it was used for, which makes it difficult to evaluate how appropriate or helpful they were. In addition, neither reported use time nor skill testing can be sufficiently used to predict abandonment once AT is deployed. Our next steps include generalizing our approach to AT (such as upper limb prosthetics), and expanding it to include a wider variety of tracked activities. In addition, we will develop a longitudinal data set that includes examples of abandonment. This will allow the creation algorithms that can characterize the type and quality of use over the lifecycle of AT and predict abandonment.